The latest and greatest artist’s rendition of The SoNo Collection: note the squared off corner in front. General Growth Properties (GGP) Senior Developer Doug Adams explains plans for traffic on West Avenue to Common Council members Thursday in City Hall. NORWALK, Conn. — Reviews were positive Thursday evening as changes, or “improvements,” to the plans for The SoNo Collection were reviewed by the Common Council Planning Committee. Although there was a little push-back from Councilman Doug Hempstead (R-At Large), the committee unanimously voted to send the latest documents to the full Council, a blessing indicating that they feel the conditions of the Concept Master Site Plan are being met. “Most of the conditions from my perspective, and I put this in the memorandum, have been satisfied at the level which would be appropriate for that master plan approval,” Cecil said. “This is a major milestone getting to this point,” Kydes said. General Growth Properties (GGP) Senior Designer Paul Madden began his presentation by explaining that the area of the mall that is planned to be next to the West Avenue Interstate 95 on ramp is now planned to be a two-story sculpture garden, with glass walls on the squared-off corner. GGP had originally insisted that the corner be diagonal to the street, with a plaza. The sculpture garden, “truly a public space,” would bring a “very landscaped edge to the building, nice place of pause and contemplation,” Madden said. The rooftop terrace, which would face east to overlook the Norwalk River and Long Island Sound, would be active year round and would include a retail pavilion, he said. 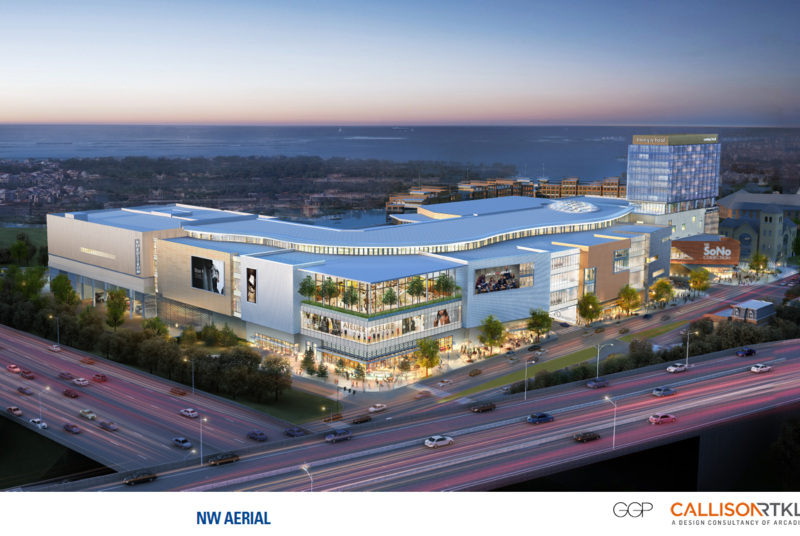 GGP Senior Developer Doug Adams said that, yes, there would be restaurants up there, but the mall would still fall below the 6 percent of its total square footage threshold in that category, as promised. Retail space was removed from the mall’s third level to create access to the roof, but the overall effect of the modifications was to “net equal” in that category, Madden said, being questioned by Kydes. Adams showed a traffic diagram that showed predictions that 60 percent of the mall’s visitors would come from the north, down West Avenue. Half the visitors would go into the entrance planned for the middle of the mall’s northern block, and 34 percent would turn from West Avenue onto North Water Street, with some of them coming from the south. Kydes asked how GGP got those numbers, as he suspected that East Norwalkers would come from the other direction. Adams said less than 2 percent of visitors would come up North Water from the other side of the railroad tracks, based on the traffic consultant’s “significant discussions” with the state, on previous traffic studies and three traffic counts – in 2014, 2015, and this year. Councilwoman Shannon O’Toole Giandurco (R-District D) wanted renderings of the mall from Oyster Shell Park, but Adams said those will come soon. A 3-D rendering of the mall should be done next week, he said. 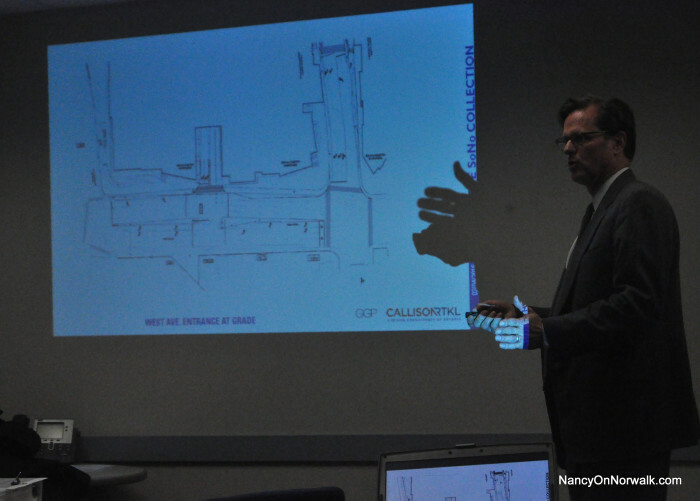 GGP’s latest design is being evaluated, Cecil and Redevelopment Agency Executive Director Tim Sheehan said. “To me the slip ramp is not a deal breaker,” Kimmel said. 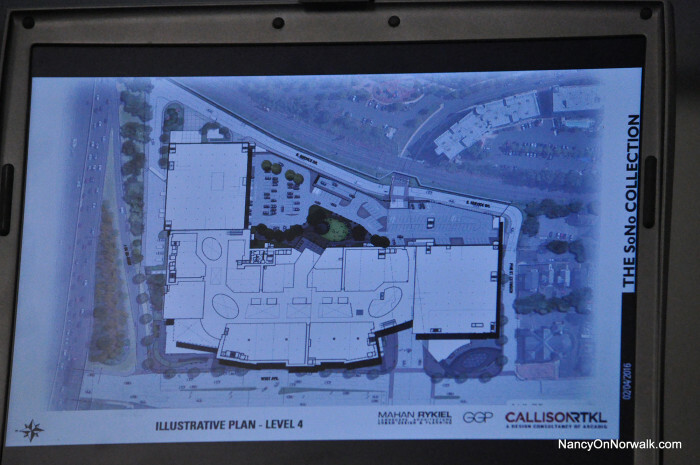 A laptop computer shows the latest plan for level 4 of The SoNo Collection. Rilling said he had seen a drawing. “I don’t know what the most recent plan that you saw was, but there’s been some significant iterations, I think it was alluded to here this evening, that no matter whether the slip ramp is there or not there, there’s been dramatic improvements that have been made to that area and the pedestrian environment has been enhanced because of it,” Sheehan replied. “I feel confident talking to Cecil Group and Mr. Sheehan, I think this issue will be resolved. I think we are almost there,” Kydes said. Madden went on to describe the interior design, saying ideas were being inspired by SoNo and its industrial waterfront and New England coastline. “We believe we have put together with material packages and some concepts that we are toying around with right now that truly have some great potential for branding this destination,” Madden said. Hempstead asked if the Land Disposition Agreement (LDA) had been signed. Adams said GGP has signed it. The city has not, but only because attorneys are making sure everything is accurate, Attorney Eric Bernheim said. “You’ll probably get information tomorrow about that exact issue. I’ll be sending some stuff out from my office,” Rilling said. It will hopefully be done on Monday, Bernheim said. The issue goes to the Council on Tuesday. “This is a fantastic project in terms of contributing public realm to the city of Norwalk from our perspective. In a quantitative way, they are exceeding what we consider to be qualifying public realm space,” Cecil said. The indoor sculpture garden has “real benefits in New England,” and his concerns about the sharp angular design at the southern end of North Water and West Avenue, where a sign would proclaim, “The SoNo Collection,” have been ameliorated, he said. He had been worried about the modern approach in close proximity to the neighboring church and “more traditional” nearby buildings, he said. GGP has convinced him that the architecture needs to be recognizable to motorists on I-95. The hole that had been planned for the North Water Street overpass, to provide light to the street and eliminate the sense of a tunnel, has been removed from the plan, Cecil said. Instead, a “notch” has been designed for the eastern end, next to the railroad tracks. “It not only brings in more light but it really changes your impression of what this building is doing and creates a sense of connection that we think is actually far better. So we are satisfied … architecturally it’s improved,” Cecil said. This results in a “very traditional architectural gesture” to have a façade set back from an entrance, he said. 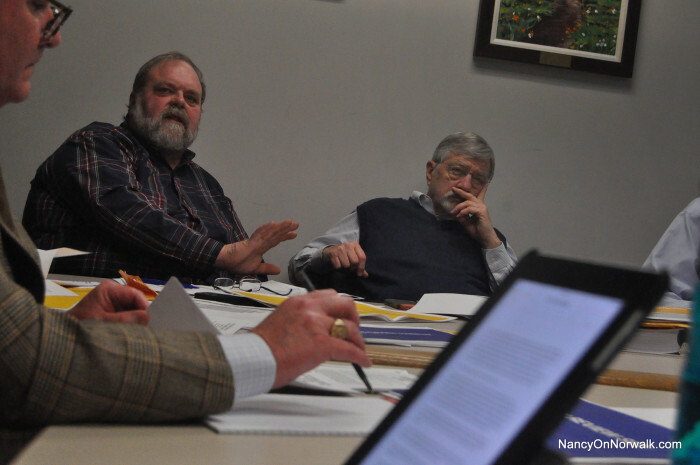 Norwalk Common Councilman Doug Hempstead (R-At Large), left, and Councilman John Igneri (D-District E) learn about the latest plans for The SoNo Collection during Thursday’s Planning Committee meeting in City Hall. Hempstead expressed dissatisfaction with the screening for the parking garage on North Water Street and asked what were the parameters of the master site plan requirements. Bernstein said he thought the screening would be part of design review, which comes later. “We are satisfied they are going to do that,” Cecil said. Hempstead pressed on the pedestrian experience, referring to language in the master site plan. “What we are seeing here is basically evidence being presented to us that a good faith effort is going on between the city and Cecil Group, and GGP to resolve these issues and that is what we wanted to guarantee,” Kimmel said. Hempstead said it’s been 90 days since the Council approved the parameters of the LDA and the “devils and details” are still being worked out. He said he wanted to make sure there weren’t misinterpretations and pressed about public realm space. Cafero said the specifics would come back to the Council later. The hotel seems like it is 12 stories tall in the attached images! Looks like “middle of the mall” garbage. Norwalk deserves better. Many thanks to NoN for publishing the drawings, and to Steve Cecil and Tim Sheehan for vastly improving the northwest corner. Squaring off the corner was a key improvement because it aligns the building with the Norwalk street grid. The planted sculpture garden would be a really great idea. It seems that there is some ambiguity about whether some of the garden would be outside. Since the city will be moving steadily south because of global warming (it is predicted to end up with a climate like that of South Carolina) the outdoor terrace would be a welcome addition. It would be nice if the roof terrace planned at the east could be raised up a bit so you could see over the parked cars that are on the same level. Although I am relieved that we are rid of the tunnel in the middle of West Avenue, the 4 lane main entrance on West Avenue will be a barrier to pedestrian travel to retailers north of the entrance. I hope they will land a retailer with a big draw north of the entrance. But at least we got rid of the ridiculous plaza at the northwest. Kudos to all for making the best of a bad situation. I would be real careful with screening the garage as Mr. Hempstead mentioned, since the views from the upper decks towards the harbor and parks will be a valuable part of the experience for mall visitors, and enough to entice them to explore the city further which is one of the program goals. Parking garages are not inherently ugly, but they certainly can be if not designed with color and texture in mind. The layer cake look with deep shadows is an easy form to improve upon, but screening will only add to the claustrophobic experience inside the garage. That experience inside the garage including preserving views out must not be underestimated, as the appeal of the mall and the ability to attract repeat visitors will include the garage experience, which is the first and last thing visitors see. It is often overlooked in all kinds of projects. I was disappointed in GGP’s garages at Providence Place in downtown Providence RI, which is a great mall otherwise that I visited recently. But I couldn’t find the stairs or elevator to the mall from where I parked my car, and there was a lack of wayfinding. The new Norwalk Hospital garage is an example of a well designed garage. I recall the application and discussion when I was on the Zoning Commission, and there was much discussion about the exterior architectural treatment and lighting. I insisted on fully shielded (full cutoff) fixtures so the garage did not appear like an overlit stadium up on the hill to be viewed from the highway and across the city, and throw glare into nearby apartment buildings. The result was successful, and the garage is not an eyesore at all. The views from that garage are some of the best in Norwalk, which make visiting the hospital just a bit more pleasurable than a screened edifice with no views out. Please, do not screen the mall garage, but just make it attractive! Make it attractive and preserve the harbor views, but keep in mind the proximity to I-95 where we don’t want high beam headlights from inside the garage shining on highway traffic to create a hazard. This illustration looks like some kind of Maxfield Parrish fantasy land. Just look at those pink and blue roads. Nice! Is there that much room down there to build all of that? And there are no bottlenecks on the highway. That’s a relief. For those who wanted a closer look at current rendition; a status on the overall project; and a presentation of the Traffic Impact Study…. PLEASE JOIN COALITION OF NORWALK NEIGHBORHOOD ASSOCATIONS (CNNA) at our February 22nd meeting, where GGP Development and Public Outreach staff will present plans, status and provide much-anticipated traffic impact data. We are allocating plenty of time for Q&A. As this project will have far-reaching impacts on all of Norwalk, we anticipate most neighborhood associations will be sending representatives to this meeting, but want all residents and business owners to know they are welcomed and encouraged to attend! Monday 2/22 at 7pm in the large Community Room at City Hall.